Here's a fictional bau story and a true recipe. It's hard to picture bau on a plate and Dad on a chair together, face to face. But curry was a different matter altogether. He had to have it everyday. Like water. Especially a fish curry. So if Mom asked (which she would do almost everyday) what she should cook with this or that, accompanied by a plagued and tired look on her face, Dad would simply answer "curry" without flinching, without looking, without thinking. You would think that that would be the end of Mom's problems. But no. That was her problem. Was that why she left him? We often wondered. Because right after she did she abandoned curry and went for bau. Bau this, bau that, it was bau, bau, bau. "What's with the bau Mom? " "This is the one thing your father hated. Bau. And I hated all that curry. Everyday. To cook, to eat, to cook, to eat. Why do you think I left him? " Janna who was strangely unaffected by our parents' divorce until that moment glared at Mom through her dark, almond eyes from behind her thick fringe. Yes, it was a long fringe that she grew so she could stare at a boy at school without looking like she was staring at a boy at school. 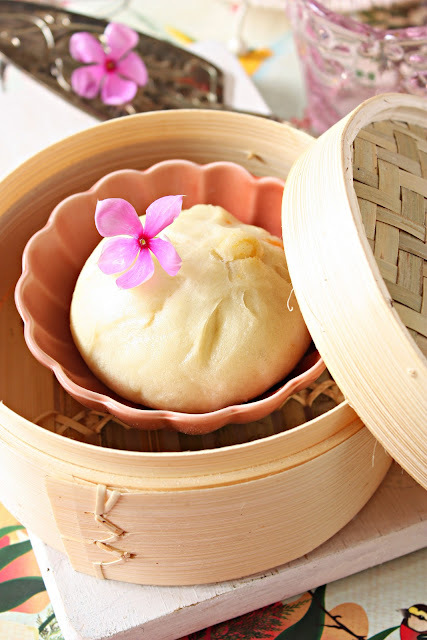 Then she got up, scraping the kitchen chair backwards against the floor, stomped over and reached for a pau. As soon as she snared it in the palm of her hand she headed for the kitchen door, opened it and stood there for a moment as if debating if that was the right thing to do. Then with a fling of an arm the white, round bun flew like a jet plane and crashed into the Cat's Eye tree about 10 meters away. Leaves rustled, birds flitted, bird wings flapped and Mom opened her mouth to start a cry of astonishment that didn't come. That was when my older sister walked out, lived with Dad and never came back.
" If you hate something bad enough it will surely come back and haunt you." With that she let out her last breath, closed her eyes and died before me. I felt her dry hand go limp in mine. I looked down at the dead tributaries of bumpy veins embossed on the back of her hand. I ran my finger along one of them, slowly. And in that silence, alone with my dead mother I heard my heart thumping and felt my temples being squeezed by God. I have never, since, hated anything as badly as I hated my mother at that moment, and myself, for not figuring it out. So that she could have saved herself. Because it was not the bau or curry after all. It was hate that consumed her life. Heat the pan and then add the cooking oil. Throw in the diced onion, garlic and ginger and saute until fragrant or the onion pieces turn translucent. Add the slurry-ed curry powder and stir and watch carefully so that the paste doesn't burn. Add the oyster sauce. Add the diced chicken, mix well and then add salt to taste. you may add a little water if the mixture seems dry. Finally pour in the cornstarch slurry and stir quickly so that the sauce won't get lumpy. Taste again and adjust salt. The final mixture should be a thick curry almost a paste with diced chicken in it. ...like spaghetti sauce or sambal. Tear off pieces of risen dough into 50 gm pieces. Roll into a ball and roll out with a small rolling pin on a floured board into a small circle about 3 inches in diameter. Thin the edges by lifting up the circle of dough and pressing the edges with your thumb and first two fingers all around the circumference. Then place the flattened circle of dough onto the palm of your hand. 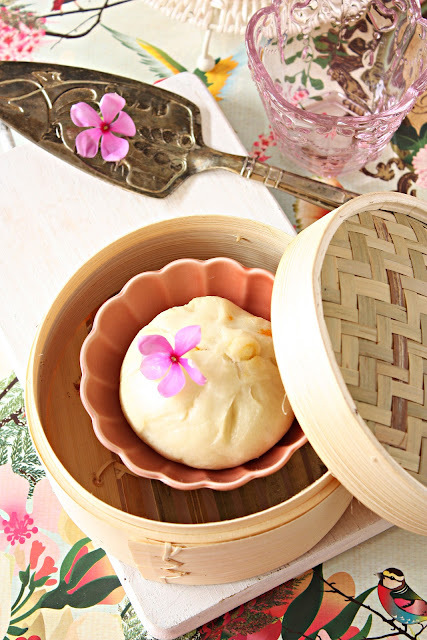 As each bun is filled and shaped line them with squares of grease-proof or baking paper and place them in the basket of a steamer (detached from the steamer bottom) about 1 inch apart. Let them rest for 10 minutes but not more (if left to rest too long the buns will rise and flop after steaming). 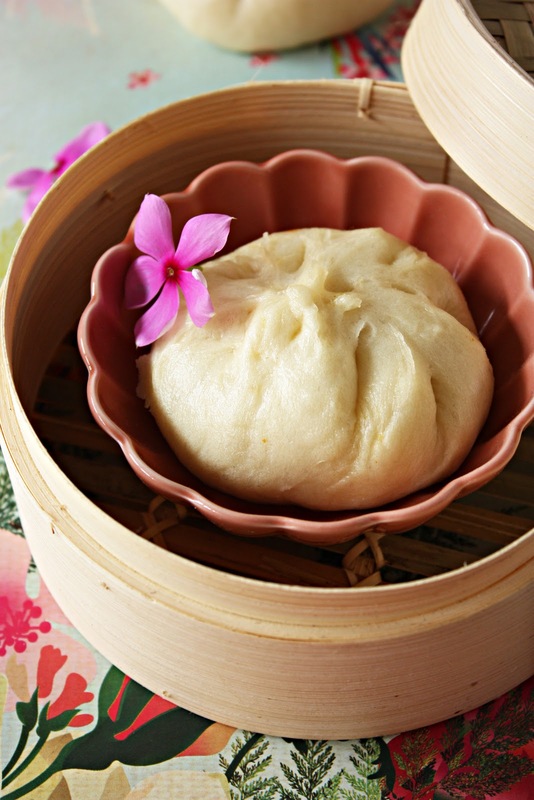 Meanwhile heat the water of your steamer to a rolling boil them place the basket of buns over the steamer pot and steam the buns for 10 - 12 minutes until risen and puffy. I didn't count but this recipe definitely made more than 10 buns. Such a sad story, but you have most definitely turned out smart and balanced. Pau and curry is a scrumptious combination! What a refreshingly different post Zurin! And I'm pleased you didn't care when the pleats weren't right. I think the more we age, the easier we are on ourselves. I'm with you, who cares. I bet it didn't change the taste. Love the sound of the curry, but for me, minus the ginger. Not a fan of ginger. I'd eat your steamed pau though just the same. Looks cute. I love a story with a good moral. It reminds me of school for some reason, when we used to have to read that kind of thing all the time. Thanks for the reminder; hatred can eat up the insides without a doubt. I have made a conscious choice to not allow it to get to me any more, whether we win our case or not. I'm not going to waste any further time on our neighbours. It's quite liberating actually, but the past two years have been filled with anxiety and hatred and it has taken it's toll. No longer. I'm feeling positive already. And I really mean it. Zurin..sad story:(Is it atrue story? You write SO well..it is hard to tell? I think it is..
People's opinions of you are interesting..:) I think they are..
MOnique, :P no its not a true story...I made it up inspired by the pau.....sad n morbid isn't it? zurin! i thought it couldn't be true bc you. ah, never mind. i'll tell you in person. gosh, i haven't checked out any blogs since the jelly thing n i'm missing all ur beautiful dishes. did u really made these with my recipe? 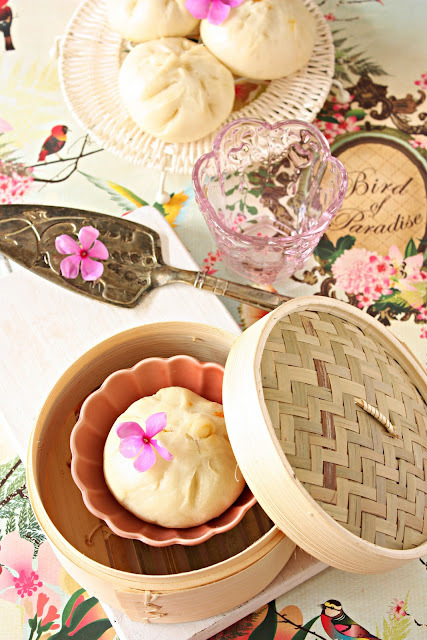 how come your bao (not pau, it's with a 'b'. malaysians!) looks so perfect lol! This is new for me! and i'm drooling! Bao and curry! i can imagine the combination! BIG BAD WOLF BOOK SALE !! !